The Bel Air was now a reasonably reliable vehicle albeit with a slightly inconsistent brake pedal. So what to do next? Upgrade the drivetrain? Convert to manual transmission? Posi-rear? Nope! Not yet. The goal was to enjoy the Bel Air way more than once in a lifetime, so clearly brakes were the next important issue to be addressed. I decided to replace all the rubber brake lines. I also wanted to upgrade to a new dual reservoir master cylinder and while we’re doing all that, might as well convert to power front disc brakes. That’s exactly how it went back in 1999 with my ’67 Pontiac LeMans … but that’s a story for another post. Ultimately, Might As Well Syndrome took the Bel Air from a basic brake job to power front disc brakes and a dual reservoir master cylinder. I’m not complaining, but that’s how projects seem to grow with me. The pads didn’t fully line up on the discs – See pic. However they stop well enough. The track width of the front wheels was supposed to increase by only ¾” according to the person on the phone but the kit actually ended up increasing track width by a full 3”. Fortunately, I have loads of space under my front wheel wells so the wheels fit fine. However, the rear wheel track width is somewhat noticeably narrower. I can live with this for now. The car drives fine but the difference in track width bugs me. I’m trying to decide if someday I should either go with a different brake kit or go with deeper offset rear wheels or spacers. Initially the braking wasn’t very good for the first few stops every time I drove the car but then it would improve after that. We were wondering if this was due to the brake pads becoming stickier as they got warmer. I found my answer a few months later when we upgraded to a rebuilt 2 barrel carb. Suddenly the brakes were consistently better from the very beginning of each drive. The mistake we made was not verifying vacuum prior to the conversion to power brakes. Had we done that we would have noticed that engine vacuum was a little weak for power brakes, especially when the engine was cold. Changing carburetors improved the vacuum at idle. The previous carb didn’t run very well and as such, didn’t create sufficient vacuum while the engine was still cold. Once the engine was warm the vacuum was sufficient to provide nearly full braking power. Now with the new carb, the engine created sufficient vacuum when cold so braking was good as soon as you started the car. Additionally, the engine made weak vacuum due to bad compression. A few years later when I changed the engine, the brakes got even better. Lesson learned: Before upgrading to power brakes check your engine vacuum at idle both when cold and when warm. 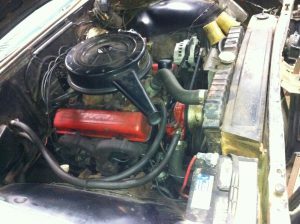 Engine: 283 ci small block Chevy, 2 barrel carb, tiny diameter single exhaust. Suspension: stock – soft, worn, and low. Exterior: basically straight with an amateur repaint job that was cracking and peeling. Also had some bad rust repair in the front fenders. Pin hole rust in the trunk floor from a leaky window. Some rust holes in the floor too. Mileage: Originally 96,824 –> probably about 99,000 at this point. My 1965 Bel Air, Part 1 – Buyers Remorse? « Trying To Sell Your Classic Car? Consider This Resource.